When the Kingdom of Italy was created in Turin on March 17, 1861, uniting the northern Piedmontese Kingdom of Sardinia with the southern Kingdom of the Two Sicilies (whose Bourbon monarchy had recently been overthrown by Garibaldi's army), the new kingdom was aggressively secular - "aggressive," that is, in an Italian sense, what we might call "aggressive Italian style." This was very much the spirit of the age - that is, of 19th-century liberal nationlism. Given the Pope's persistent sovereignty over Rome, it was perhaps inevitable that any nationalist movement aimed at Italian unity (liberal or not, although in fact 19th-century nationalist movements tended to be liberal) would be anti-clerical in character. This was so despite the fact that the reigning house of the new Kingdom of Italy, the House of Savoy (one of the oldest royal houses in Europe) had a long history of devotion to the Church (and was - until King Umberto II's death in 1983 - the owner of the holy relic, the Shroud of Turin). The bad blood between Italy and the Holy See would only escalate, of course, after Italy's conquest of Rome from the Pope in 1870, reducing the Pope-King to a "Prisoner of the Vatican." All this changed again, of course, in 1929, when Benito Mussolini, then considered a "man sent by Providence," accomplished what the liberal governments that had preceded his had so conspicuouly failed to do - reconcile Church and State, in a way that benefited both. The Concordat that accompanied the Lateran Treaty established Catholicism as the official religion of the kingdom. 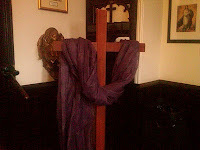 My mother can still remember the day when the crucifix was restored to the school classroom. Mussolini is long gone - as is the House of Savoy. Republican Italy retained the concordat in its constitution, however, and the crucifix stayed up in the school classrooms. Italy is now, of course, part of the EU, that anti-democratic, imperial buereaucracy that seeks to subsume all national and cultural differences under its almighty boot - a notoriously secularist boot. The EU's twin imperatives of cultural homogenization and secularization came together in a 2009 judgment by the European Court of Human Rights that the Italian law requiring curcifixes in public school classrooms violates the "European Convention on Human Rights." Italy appealed in 2010, and won its case in a March 18, 2011, decision of the European Court of Human Rights' appellate court. Had the decision gone the other way, one wonders what Italy might have done. Personally, I would have loved to have seen Italy defy the EU Court and assert its proper sovereignty over its own internal affairs and historic culture. Given the increasingly perilous condition of the Eu (brought on in large part by its foolhardy decision to adopt the Euro), perhaps member states might have found the courage to defy the tyranny of Brussels bureaucrats. Perhaps not. In any event, the Court ruled in Italy's favor, but did so on such bizarre grounds that one wonders what the judges might have been thinking. If the Court had simply ruled in favor of the crucifix on the grounds that the presence of the crucifix in the public school classroom (like the crucifix in Quebec's National Assembly or "In God We Trust" on American currency) is part of the coutntry's historic and cultural heritage, that would have made sense - and would have been a welcome recognition both of Italian sovereignty. Likewise, arguing that the presence of the crucifix in the public school classroom reflects the obvious will of the overwhelming majoirty of Italians woudl have been a welcome argument - an expression of some modest deference ont he part of the EU bureaucracy to that most un-EU value, democracy. However, the Court went further with truly weird arguments suggesting that the presence of the crucifix had no really religious significance and coveyed no really religious message. All who believe in democracy and national sovereignty should certainly support the continued presence of the crucifix in Italy's public school classrooms. Those of us who also believe the crucifix actually signifies something more than merely a quaint cultural-historical memory must, however, be troubled by such weird reasoning. It is an undisputable historical fact that the Chrisitian religion (and indeed the Church as an institution) are inextricably linked to Western culture and to try to excise them from Western culture can only be based on historical mendacity. That said, believing Christians must also continue to assert the real, live, present-tense significance and evangelizing power of Christian symbols, and so resist their reduction to artifacts in a historical theme-park. Living in a rather humid climate, we may be tempted to romanticize the desert. In certain circles, it is even trendy to speak of spiritual “desert experiences.” In the Bible great things did indeed happen in the desert. But let’s not romanticize it! Deserts are harsh and hardly habitable places. Even relatively livable deserts like Judea and Samaria - or California - are places where water is scarce. So access to it is power. Even Jesus, wandering through Samaria at the hottest hour of the day, needed to ask for a drink. Having no bucket of his own, he must at first have seemed to the Samaritan woman as powerless indeed; but at least there was a well there! Obviously, we are looking here at very typical human behavior – both on the part of the people and Moses’ reaction – typical human behavior, unique neither to the Bible nor, for that matter, to the desert. People complain constantly, and those they complain about constantly complain - about being complained about! It’s become a commonplace observation – itself yet another complaint – that contemporary American society has been increasingly paralyzed by a corrosive climate of criticism of (so it seems) virtually everything and everyone. Sadly some of the same can be said even within the Church. Such an atmosphere takes its toll on everyone, as it obviously did with Moses. But Moses’ frustration was far from the end of the story. God is so much bigger than our complains, quarrels, and conflicts. However deep-seated human sinfulness and however widespread its destructive consequences, God still has the final word: water will flow from the rock for the people to drink. For us, of course, the water from the rock foreshadows that living water that Jesus promised the Samaritan woman, the water that eventually flowed from the side of the dead Christ on the cross as a symbol of the water of baptism, that is meant to drown all our thirsty grumbling in his new and risen life. The season of Lent is organized around two converging themes: conversion and repentance - and two corresponding sacraments: baptism and penance. Foreigner though she was, the Samaritan woman was responsive to Jesus and receptive to conversion. Indeed, she became a missionary – and apparently quite a successful one, preaching not just with words but by the powerful witness of her transformed life. Perhaps the people in that Samaritan city simply sensed that what Jesus had done for her was what we all need and want – to be known and loved as we truly are and so to find the refreshing possibility of renewed life. Hence the significance of her story for those preparing for baptism at Easter. But what about the rest of us, baptized long ago and life-long (or at least long-term) members of Christ’s Church? Have we perhaps lost some of our fervor? Are we maybe more like Israel in the desert, quarreling and testing the Lord, wondering “Is the Lord in our midst or not?” The Israelites had 40 long years ahead of them in the desert, and there would be more scenes such as this one. It seems that no matter how many times God quenches our thirst, as long as we remain in this desert, the same questions continually confronts us: “Is the Lord in our midst or not?” It’s a question we cannot escape, anymore than the Israelites could escape on their own from the desert in which they found themselves. In Jesus, God has given us an answer once and for all. It is up to us, then, to do like the Samaritan woman and take that answer seriously, and so be able to say with Saint Paul: we have peace with God through our Lord Jesus Christ [Romans 5:1]. Lent challenges us to rediscover the new life first offered us in the living water of baptism, offered again and again in the sacrament of penance. Homily for the 3rd Sunday in Lent, Immaculate Conception Church, Knoxville, TN, March 27, 2011. One of the charms of Facebook is how it announces one's birthday to all of one's "friends." The result is a lot more "Happy Birthday" greetings than one might otherwise ordinarily expect to be getting! Last year, I let my birthday pass without any public reference in my brand new blog. That may have been the wiser course, but successfully completing yet another year of life does seem to warrant at least some modest comment. offer opportunities to experience. There may still be accomplishments ahead. (I certainly hope so!) Even so, at 63 one naturally tends to look back more than ahead. I also can't help but recall that, when I entered the Paulists in 1981, 63 was "retirement" age. Not that everyone necessarily "retired" at that age, of course, but it did serve as a certain sort of marker. Remembering that, it still serves as a marker (even though the Paulists have wisely long since raised the age for what we now call "Senior Ministry Status" to the much more appropriate age of 70). Secretary of Defense famously said, "You go to war with the army that you have." That said, I think there really is something to the idea that there is a certain wisdom to be found in old age - not just knowledge (although accumulated knowledge of life has certianly made me "wiser" than I was at 23 or 33 or 43 or 53), and not just experience (although again lived experience certainly has taught me a lot and has definitely maked me "wiser" for it). There is also an emotional development that seems to occur over time as one works one's way through the joys and sorrows of life, its attainments and its learning to let go (especially that). Some things that seemed to matter a lot years ago matter less - and vice versa. At any rate, things matter differently. But, while passion is certainly subdued, emotion remains acute. The desire to be loved and to love is every bit as real as it ever was, but the ability to love has undergone development - for the better. So, thank you to everyone everywhere who has wished me a "Happy Birthday," bringing together through the accumuilation of those greetings so many strands from so many periods and places in my life. Thank you to all those who have been a part of my life and helped me become who and what I am. And thank you, God, for giving me life and the multiple opportunities to experience your presence and your action in this world! 100 years ago, on March 25, 1911, in New York City (roughly where NYU is now), 149 workers at the Triangle Shirtwaist Factory, mostly women, most of them Jewish or Italian immigrants, were killed as a result of one of the most famous fires in American history. The previous year, garment workers throughout the city had gone on strike for unionized working places - unions being the only way to guarantee decent pay and safer working conditions. At least for the Triangle workers, however, the strike had failed, for the factory's owners successfully resisted unionization. What a city-wide strike had failed to accomplish, however, the tragic deaths of so many young women did, finally tipping the scales in favor of workers' rights. New York City and State soon adopted new laws that served as model public-safety codes and labor-relations laws for other states and later the federal government to emulate. One of those who stood in the street watching the fire was Frances Perkins, who served as FDR's Secretary of Labor from 1933 to 1945 and who famously called that tragic March 25, 1911 the day the New Deal began. The Labor Movement undoubtedly has had its faults and failings, and the right of public-sector unions to strike has always and for good reasons struck many as somewhat questionable. That said, it cannot be denied that the period of greatest, most widespread prosperity and social harmony in modern American history was also the era when labor unions were most powerful. There are good things one can say about globalization, of course, but one of its negatives has been its impact upon American workers. In a globalized world market, national governments simply don't have the power they once had to guarantee workers' rights. (Obviously, one of the reasons public-sector unions have grown in recent decades, even as the unionized percentage of the American labor force has been declining overall is that, unlike other businesses which can simply move their factories to take advantage of cheaper labor, governments normally stay in one place). Particularly troublesome has been the enormous increase in income inequality in the US in recent decades. Nor is it just a matter of money. The old saying that the rich are no different from eveyone else, they just have more money, is only partially true. Not having a feudal past, not having a hereditary aristocracy, American society for most of its history did indeed enjoy an unprecedented amount of social mobility, which fostered widely shared democratic and egalitarian vlaues. Even so, the very rich really always were different. The Rockefellers and the Kennedys (however much they cultivated a common touch to advance their political ambitions) lived lives completely different from that of most ordinary Americans. Apart, however, from those relatively few who fell into that distinct category of the super-rich, most successful, wealthy corporate types were seldom so much richer than those who worked for them that they could no longer relate to the rest of America. When I was growing up, my father's boss certainly made more money than my father. He lived on Fifth Avenue and presumably enjoyed many of the finer things in life that only money can buy. But I suspect that his fundamental values and view of the world were not all that markedly different from those of his employees. The incredible gap that has opened up in recent decades between the overwhelming majority of ordinary Americans and the obscenely wealthy beneficiaries of so much of our public policy since 1980 has created a complete cultural and moral chasm - not unlike that which Abraham describes in today's Gospel account of the rich man and Lazarus (Luke 16:19-31). So, on this centenary of the Triangle Fire, perhaps we would do well to remember how we as a society responded the last time inequality seemed to be getting too excessive and the resulting benefits of those reform policies for generations of Americans - and to ask ourselves how we let ourselves lose so much so quickly and what, if anything, is to be done about it. When it comes to human behavior, there really does seem to be nothing new under the sun. In today’s Gospel [Matthew 20:17-28], Jesus has again told his disciples what lies in store for him in Jerusalem. The 1st time he did this, Peter had tried to talk him out of it, prompting both a severe reprimand and a no-nonsense instruction on what being a disciple really means. The 2nd time, the disciples they argued among themselves about which was the greatest. When asked what they’d been arguing about, their silence suggested at least some sense of embarrassment. Here, however, with no hint of embarrassment, two of Jesus’ most favored disciples (and thus the ones most especially susceptible to a sense of entitlement) have their mother request that they be given the best seats in the kingdom. Not surprisingly, the other 10 quickly became indignant. Apparently, they neither accepted nor were willing to cater to the particular status hierarchy favored by James and John. Jealousy (as Britain’s Queen Alexandra famously said 101 years ago) is the source of so many problems in life. The 10’s jealous indignation in turn prompted yet another much needed instruction from Jesus – clarifying both what his life is about and what the life of any would-be disciple must be about. What makes this incident so wonderful is the brilliant way Jesus handled his hard-to-teach disciples – both the 2 ambitious brothers and the 10 jealous others. Jesus was obviously a very good teacher. He recognized his disciples’ natural ambition. Rather than condemning them, he affirmed their ambition and gave it completely new content. So you want to be great, Jesus tells his disciples. OK, then, be great – but not by imitating all those rich and prominent people you all admire and envy so much, but by imitating me. “For the Son of Man did not come to be served but to serve and to give his life as a ransom for many.” How’s that for an ambition to aspire to, an accomplishment to envy? If following Jesus is to have any real meaning, Jesus is telling us, then it must be different with us from the way it is with the rest of the world. By his own life – and above all by his death – Jesus illustrated that by showing how different it is with him from the way it tends to be with us. Our task is not to analyze the world, which is just being the way the world is, but to change the world – but to do so by having him change us. Besides being the 2nd Sunday in Lent and the 1st day of Spring, yesterday was also the anniversary of my first blog post. While hardly an occasion of world-historical significance, it certainly at least warrants a moment’s reflection – if only to consider whether these 182 postings to date have been worth it (and are worth continuing). Although I can often talk easily and at length, I frequently find writing much more onerous – one reason perhaps why I was never really cut out to be an academic. I have always envied people who can write, for example, a regular newspaper column. (To some extent, that’s what a blog tries to approximate – without, of course, the mass audience!). 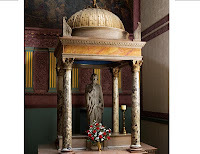 Some of my postings have been Sunday or occasional homilies preached primarily either at St. Paul the Apostle Church in New York City or, more recently, at Immaculate Conception Church in Knoxville, Tennessee. Averaging approximately one such homily per week, that means somewhere between one-quarter and one-third of my postings would have been composed in any case, blog or no blog. The other postings run the gamut of social, political, and personal reflections - all of varying length, significance and (one must also assume) quality. Certainly, a lot has happened in society and politics these past 12 months to warrant my modest reflections. A lot has happened in my personal life too, only some of which - for example, my moving from New York to Knoxville - has found its way onto the pages of this blog. In creative writing terms, perhaps it seems like "cheating" to have included so many homilies, all of which would have been composed in any case, blog or no blog. On the other hand, the fact that one-quarter to one-third of these posts have been homilies does say something significant. The fact that so much of my blogging has been explicit preaching - preaching that took place in a church as part of a liturgy - highlights that I am very much a preacher. Preaching is a central dimension of my vocation as a priest and a Paulist - ordained to proclaim to the world the Word of God in all its fullness in the Person of Jesus Christ, accessible in the life of the Church. I don't only preach, of course; and I am far from being a stellar preacher by any standard or measure; but preaching is at the heart of who I am; and it seems only right to reflect that in these pages. Any modern pilgrim, who’s had the scary experience of reaching the top of Mount Tabor after a high-speed taxi ride up the narrow mountain road might well be tempted to echo Peter’s sentiments! Peter presumably had walked up the mountain and in any case the experience to which Peter was reacting was a much more transcendent one. For what Peter, James, and John were being treated to was nothing less than an experience of the glory of God, an awesome peak into another world, and a glimpse of Jesus’ divine nature as Son of God and his fulfillment of the Old Testament (represented by Moses and Elijah). It must have been a very exciting experience! No wonder Peter was so glad to be there! Wouldn’t we all? No wonder he wanted to stay there as long as possible – to make three tents there, one for Jesus, one for Moses, and one for Elijah! No wonder he thought that this was it and that he’d reached where he was going! No wonder he didn’t yet understand that this was just the beginning – an invitation to join Jesus on his journey. Today’s 1st reading from Genesis recounts that pivotal historical moment when Abraham first appeared in the world stage. Until then, human history had been one tragic calamity after another – culminating in the decisive breakdown of the human community at the Tower of Babel. Suddenly, God was intervening in history in a new way, singling out one individual – and, through him, one family and, eventually, one special nation – to be his partner, his human partner, in repairing the damage done by human beings to God’s good creation. Under the provisions of the extraordinary covenant God made with Abraham, God and Abraham – and Abraham’s descendents – will collaborate together and so become a blessing for the whole world. Abraham is considered the common spiritual ancestor of Judaism and its two daughter religions, Christianity and Islam. In all three religions, Abraham is revered for his faith, a faith that summoned him (at age 75!) to go forth to a new land. But the destination was vague. We call Abraham “our father in faith.” If Abraham is a model of faith for us, he also reveals how much faith requires. What we call Abraham’s “faith” was a way of responding to the ambiguous and complicated events in his life, a way that reflected his recognition of the presence and action of God in those events. His “faith” meant a total trust, confidence, reliance on God through whatever changes and challenges might be required. Change is always challenging. That’s why we wisely try to avoid it unless necessary. I am particularly fond of Chesterton’s line (at least I think it was Chesterton who said it): “If change is not necessary, then it is necessary not to change.” But sometimes it is necessary, and therein lies the challenge. It may mean abandoning the familiar for the frightening. It may mean something totally new. Or it may not. It may mean, rather, recovering what we’ve lost or forgotten or abandoned. Indeed, the most challenging change may be to undo bad decisions and recent choices in order to return to an older and better path. We all talk about making necessary changes in our lives. Sometimes we may even mean it. But we’re just as likely to conclude that we have too much at stake to change course. Lent is our annual opportunity to let Abraham demonstrate the power of faith to overcome our cynicism, despair, defeatism, and spiritual inertia. All this has finally and effectively been made accessible to us through Abraham’s greatest descendent, Jesus, who fulfilled in himself his nation’s destiny and made Abraham’s blessing fully available to the entire world. Homily for the 2nd Sunday in Lent, at Immaculate Conception Church, Knoxville, TN, March 20, 2011. Last night, at our weekly parish Lenten supper before the Stations of the Cross, I blessed the meal using the formula for the “Blessing of St. Joseph’s Table” – a tradition of blessing food in honor of St. Joseph, who provided for the Holy Family, and whose feast the Church celebrates today. In modern times, St. Joseph has, so to speak, come into his own. Even this morning's Knoxville News Sentinel featured a column devoted to him, entitled "Honoring Joseph, a father who 'manned up'." In the New Testament, however, St. Joseph appears only briefly (and silently) in connection with the early life of Jesus. Matthew’s gospel praises him as a righteous man [Matthew 1:19], but significant devotion to him did not develop until much later. Amid the many calamities of 14th and 15th century Europe, however, popular preachers like St. Bernardine of Siena saw St. Joseph as a model family head and household administrator. In the 16th century, St. Teresa of Avila placed her reform of the Carmelites — and the dangerous journeys it involved — under his protection. As part of the Counter-Reformation’s strategy of re-evangelization, families were encouraged to imitate the Holy Family headed by St. Joseph. In 1729, his name was inserted in the Litany of Saints. After the Kingdom of Italy conquered Rome from the Pope in 1870, Blessed Pope Pius IX proclaimed him the Patron of the Universal Church, under which title the Church venerates him today. In 1955, Pope Pius XII established an additional new feast of St. Joseph the Worker on May 1, to counteract the Socialist-Communist May Day holiday. In 1961, Bl. Pope John XXIII made St. Joseph patron of Vatican Council II, and the following year inserted his name in the Roman canon (et beati Ioseph, eiusdem Virginis Sponsi). In 1851, a group of Redemptorist missionaries (among them the relatively recently ordained Isaac Hecker) sailed from Europe to the U.S. Delayed by bad weather, they made a novena to St. Joseph in the hope of arriving in New York by March 19. “St. Joseph will have to do his very prettiest to get us in,” the Captain retorted. On March 16, he said “St. Joseph can’t do it – give it up.” But the priests persevered in their prayers. That night the wind changed, and the ship began to speed – at 14 m.p.h.! 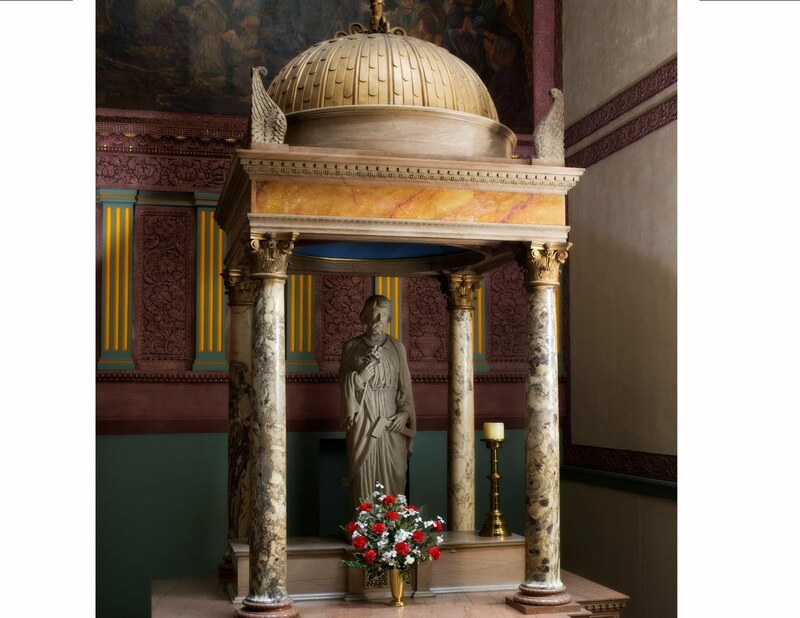 After 52 days at sea, the ship arrived in New York on March 19, the feast of St. Joseph, and the Redemptorists were soon ready to commence the first English-language parish mission in the U.S. - at St. Joseph’s Church in Manhattan. It is always refreshing to read a work which takes the canonical text and the way it has been interpreted int he Church's life seriously as a fundamental point of departure. Since the book basically covers Holy Week and Easter, it offers some fresh insights for prayer and preaching as Holy Week approaches. With their personal books, Pope Benedict and his soon-to-be-beatified predecessor, Pope John Paul II, have certainly raised the bar in terms of what will now be expected intellectually from contemporary popes! St. Patrick's Day was unavoidable in New York. In High School, I had to march in the parade. In the 1990s, when I was working for the Archdiocese, I, of course, had the day off. For the past 10 years, as a priest in New York, I was required by the rubrics of the liturgy to celebrate the local patronal feast. Here, however, although my church has a beautiful window dedicated to St. Patrick, it is a day like any other. Great misisonary evangelizer that he was, St. Patrick undoubtedly deserves all the honor he receives, however far afield some of that honor may stray from what he was actaully all about. The son of a deacon and grandson of a priest, Patrick was born into a well-to-do family of landed gentry in the Roman province of Britain. At 16, however, his comfortable life suddenly ceased when he was captured and enslaved by Irish raiders. During 6 years as a slave herdsman in Ireland, Patrick’s conventional Christianity was transformed into an ardent, fervent faith. After a successful escape and return to Britain, he felt a call to convert the pagan Irish to Christianity. Ordained a bishop, he returned to Ireland and remained there until his death on this day in 461. The de facto leading spokesman for the Church in contemporary Ireland is Diarmuid Martin, Archbishop of Dublin. Last month, Archbishop Martin spoke at Magdalene College, Cambridge, where he offered a telling analysis of the current state of (and the challenges facing) the Church in Ireland. That analysis was amplified further a few days ago in another talk he gave, this one on the relationship between Church and State in Ireland. Inevitably, much of his analysis speaks to a specifically Irish situation (a one-time "bastion of traditonal Catholicism" now quite changed from "the conformist Ireland of the Archbishop McQuaid era"). The present of every local Church is conditioned by its past, and the future of every local Church is correspondingly conditioned by how it intereacts with that historical legacy. That said, Archbishop Martin's analysis also addresses the wider concerns of the Church in contemporary, post-modern, secularised societies. The bottom-line difficulty facing the Church not just in Ireland but throughout the secularised West (including even the United States) is reflected in (and in turn exacerbated by) the vocation crisis and its ripple effects. "The number of priests are falling. There is more work to be done by preists who are getting older. The task of simply responding to the deay-to-day demands of ministry leaves many priests with little time to take on new tasks and address radically new ways of life and ministry." At the very time - the last third of the 20th century - when Western society took its giant leap into secularism, the Catholic Church also underwent a period of rapid and intense internal change. As Martin notes, "the [Second Vatican] Council was ineviatably received in terms of the culture of the day which at times may have coloured the interpretation of what the Counciul intended." Certainly in the U.S., disputes over the correct intepretation of the Council's intent have contributed to contrasting visions of what the Church is all about and a demoralyzing polarization that has further sapped the Church's evangelizing energy. At Cambridge, Martin suggested that all was not well in "the good old days" - resulting in "faulty foundations" for "structural change." In his March lecture, he makes the broader observation that, while Church renewal requires structural renewal, such "a renewal of structures alone would be sterile." Renewal, Martin argues, "can only be shaped from the perspective of Chrsitian life" and it is "the nature of the Church" which must dictate the "strucutres of reform of the Church." My own sense is that so much debate about structures in the Church suffers from an excessive reliance on political categories of analysis and lacks precisely the all-important focus on the essential nature of the Church, which, whatever its relation with its surrounding culture, cannot allow itself to be assimilated to it. Martin himself makes this point quite clearly, emphaiszing it by repeating it in both talks: "the farther the Church goes in adapting to the culture of the times, the greater the danger is that it will no longer be able to confront the culture of the time. It will only be able to speak the language of the culture of the day and not the radical newness of the message of the Gospel which transcends all cultures. There this happens, then the life of the Church becomes a sort of civil religion, politically correct, but without the cutting edge of the Gospel." In light of the concerns expressed in recent studies highighting the Church in America's ambibuous perfomance both in retention of its members and in the recruitment of new members, do we in the U.S. need to take more to heart this challenge from one of the heirs of St. Patrick? Remember, you are dust and to dust you will return. What is it about having dirt smudged on your face and being told that you're going to die that makes this day such an irresistible draw for so many people? Could it be - could it just be - because it is true? In this "information age," we are assailed on all sides by all sorts of "information," whether we need it or not and whether it is true or not. Could it be - could it just be - that in this age of "spin" and lies upon lies, we are finally being told something that is true? To be sure, dying has never been among the more popular topics of conversation - although that may be beginning to change now that my generation of so-called "baby boomers" has started to hit 60 and look forward to Medicare. As I look ahead to turning 63 in two weeks, I am acutely aware that I'm not anymore what I once was - and never will be again! Death, of course, is that divine command that says "Stop" - the one divine command that we absolutely cannot disobey, no matter how hard we try. I think it is really a great example of the Church's liturgical genius that it can take something so fundamentally ugly as death and ritualize it so well! Clearly, Lent owes a lot of its unique and powerful appeal to the way it confronts us with the inescapable reality of of who we are in relation to God and challenges us to face up to that reality - something we sinners by and large generally don't care to do and try so hard to avoid doing. Lent is the Church's annual wake-up call to make us remember who we are and where we're going and how we hope to get there. Ultimately, of course, Lent is not about death but about life - the new life in Christ that began for each of us at baptism. Lent is the Church's annual wake-up call to take seriously who we are in Christ and what this new life of his that began for each of us at baptism really is. It's a time to reflect once again on life's big picture, to renew ourselves at the heart of who we are, in the community of Jesus' disciples - converted, renewed, and reconciled in a new and better way of being human. Homily for Ash Wednesday, Immaculate Conception Church, Knoxville, TN, March 9, 2011. Jesus solemn warning at the conclusion of his Sermon on the Mount - “Not everyone who says to me, ‘Lord, Lord’, will enter the kingdom of heaven, but only the one who does the will of my father in heaven” [Matthew 7:21] - was not addressed to people generically, but rather very specifically to those who believe in him – that is, to us. Surely, we have all heard that old cliché: If I were put on trial for being a Christian, would there be enough evidence to convict? Well, guess what? On Judgment Day, Jesus warns, it will not be enough to have believed, to have said ‘Lord, Lord’, to have professed faith in Christ and considered oneself a disciple, without having also therefore lived in a way which warrants one’s being recognized as such – by him first of all! Even those entertaining superstars who drive out demons and do mighty deeds don’t get guaranteed a place in the kingdom without corresponding, recognizable action. Once again, we are being reminded that we really are what we do. That is: what we do, how we live, reveals who we are – and who we hope to be, the kind of person we will in fact be for all eternity, thanks to our actions in the here and now. In this regard, I really like the image Jesus uses of the house – the house built on rock vs. the house built on sand. So often Jesus’ parables reflect their rural roots in the agrarian society in which they originated. Fair enough, but not all of us live on farms or in rural villages. But everybody everywhere needs and depends on adequate shelter – and so can relate to the universal image of a well-built house. Jesus’ image, however, should also us that we do not build our house entirely on our own, all by ourselves. The faithful disciple may indeed be like the one who builds a great mansion on a foundation of solid rock. The rock, however, is not built by the builder. It is there for us to build upon, but it is not of our own making. It is, so to speak, a gift, to which we respond by building well upon it. We give thanks for that gift by what we build, by the life we live, all made possible in the first place by the firm foundation we have been given. Often in recent years, riding the bus between New York City and Newark Airport, coming out of the Lincoln Tunnel, I have often found myself staring at a particular building built on top of an especially impressive outcrop of solid stone at the end of a Jersey City street. I think it’s a public library now, but it was obviously originally built as a private house. Looking at it is almost enough to make one want to sing a verse or two of John Rippon’s stirring 18th-century hymn that begins: How firm a foundation, ye saints of the Lord, is laid for your faith in his excellent word! So, even before we worry about building, first and foremost we have to make sure we are building on a firm foundation – and not on any of the faulty structures that seem so tempting today. Jesus famously promised to build his Church on the solid rock of the revelation of who he is and what he is all about, rather than the shifting sands of popular alternatives. This coming Wednesday, we will all come to church to be signed with blessed ashes – reminding us of our mortality, calling us to conversion and repentance, and identifying us publicly, for all the world to recognize, as his professed disciples. Jesus challenges those who would want to be recognized by him as his disciples to build ambitiously upon the firm foundation of his freely given grace. Rather than sink into the superficially seductive sand that so deceptively lures us every which way, let us build - with God’s gift of himself as our firm foundation – a beautiful building for all eternity, out of what we make of our lives in the here and now. On this day in 1789, the US Constitution went into effect. It was apparently an inauspicious beginning. Not enough members of Congress had even made it to New York in time to constitute a quorum, and it would be almost two months before George Washington would finally be inaugurated as the first President. But the government did get going, and every four years after that - from 1793 through 1933 - the United States inauagurated a President on this date. 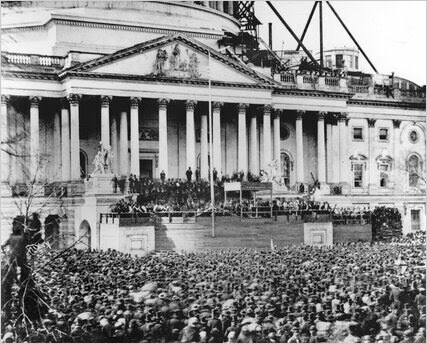 150 years ago today, it was Abraham Lincoln's turn to be inaugurated at what was perhaps the most precarious moment in American history, when the very existence of the United States was threatened as never quite before or since. (Tennessee was what was then called a "border state." It had not yet seceeded - something that would not happen finally until June). Lincoln's 1st Inaugural Address is justly famous for his appeal - simultaneously reasoned and passionate - for the country to stay together. His emotionally powerful conclusion still resonates in a society still sadly all too deeply divided: We are not enemies, but friends. We must not be enemies. Though passion may have strained it must not break our bonds of affection. The mystic chords of memory, stretching from every battlefield and patriot grave to every living heart and hearthstone all over this broad land, will yet swell the chorus of the Union, when again touched, as surely they will be, by the better angels of our nature. 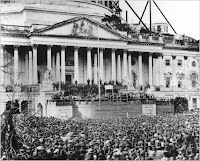 Lincoln's speech contained more than memorable and inspiring rhetoric, however. It was a well articulated expression of a philosphy of democratic constitutional government. Lincoln had strong convictions about what a democratic polity entailed and did not hesitate to express them, even to the likely discomfort of the man who a few minutes later would administer the Presidential oath of office to him - Chief Justice of the United States and author of the infamous Dred Scot decision, Roger Taney. Confronted with the calamitous consequences of that particularly malevolent exercise of judicial imperialsm, Lincoln laid out his position - the position of democratic constitutionalism - with a lawyer's clarity. I do not forget the position assumed by some that constitutional questions are to be decided by the Supreme Court, nor do I deny that such decisions must be binding in any case upon the parties to a suit as to the object of that suit, while they are also entitled to very high respect and consideration in all parallel cases by all other departments of the Government. ... At the same time, the candid citizen must confess that if the policy of the Government upon vital questions affecting the whole people is to be irrevocably fixed by decisions of the Supreme Court, the instant they are made in ordinary litigation between parties in personal actions the people will have ceased to be their own rulers, having to that extent practically resigned their Government into the hands of that eminent tribunal. One could hardly have said it better. Of all the many modes of transportation, I have always liked trains most of all. (Prior to my knee and back problems a couple of years ago, I invariably even preferred the New York City Subway to riding the bus!). Forty years ago, an assignment in my undergraduate American Political Thought class was to write an American "Utopia." There are any number of things about the America I envisioned in that paper that I might not subscribe to today, but the privileged status of inter-city train travel that I included in my "Utopia" expressed an anti-automibile bias I still feel (even if I now have to drive a car every single day!). All this is on my mind because of reading George Will's political column in the March 7 Newsweek. As for Will's take on trains, his title says it all: "High Speed to Insolvency: Why Liberals Love Trains." Now Will is undoubtedly one of the brighter bulbs in the conservative chandelier, and there have been many occasions over the decades when I have found much wisdom and insight in his analyses. Nor do I necessarily doubt Will's facts, however much I disagree with his pro-car ideology. He is probably correct on the costliness of rail transportation. Indeed, I am almost willing to stipulate that probably any other way of getting from place to place - bus, plane, or even auto - is probably more efficient and less expensive to society in the long run. But I still prefer trains! Some of that may be purely personal and esthetic. Airline travel was once seen as luxurious, but not anymore. Trains are the one mode of travel (apart perhaps from ships, which are also largely irrelevant as alternatives) where one can really sit in comfort and also walk around, etc. Admittedly, however, that is a highly personal preference. At its heart, however, Will's argument is about freedom - individual freedom. "To progressives," contends Will, "the best thing about railroads is that people riding them are not in automobiles, which are subversice of the deference on whihc progressivism depends. Automobiles go hither and yon, whever and wherever the friver desires, without timetables," Will continues. "Automobiles encourage people to think they - unsupervised, untutored, and unscripted - are masters of their fates. The automoibile encourages people in delusions of adequacy, which make them resistant to government by experts who know what chopices people should make." That quasi-libertarian argument resonates deeply at the roots of Americna experience. As I have often said, in explaining American values to European friends, most of our ancestors came here to get away from overly controlling social structures, which is why Americans will often choose the excesses of liberty over the security and comfort of government intervention in their lives. I understand that - and can even agree with it up to a point. But there is another dimension to human existence, which an uncritical preoccupation with liberty misses. What is so powerfully appealing about trains to me is how irreducibly (as I believe Tony Judt once remarked) public traveling by train is. It is a communal experience, which for me taps into the fundamentally social dimension of human nature - the very dimension which is so thoroughly under attack today. Trains may not be efficient. They probably are more costly than we can as a country afford at present. But they represent something we cannot afford to forget about why we need a country and what it takes to flourish as full human beings - something we forget to our great peril.